By the end of the third year of its second tenure, the PPP was in dire straits and for once it had no one to blame. The PPP’s supporters were dejected and disillusioned, and did not even travel the distance between their homes and the polling stations in the general elections of 1997. This handed a thumping majority to the PML-N.
Over much of the past decade, power politics had tried in vain to attain a workable balance between the head of state and the head of government. It was thought that had the president also belonged to the ruling party, there would be no infighting. But the PPP’s second stint in power proved this wrong. 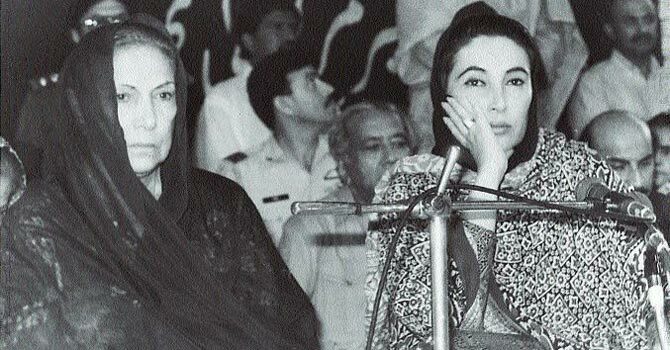 The PPP did initially use its new position to its advantage. The party had formed government in the centre and in Sindh; it had to relinquish the cherished government of Punjab to its coalition partner in the centre, the PML-Junejo, while the PML-N had its way in what is now Khyber Pakhtunkhwa and an upper hand in Balochistan. The PPP soon toppled the PML-N government in Khyber Pakhtunkhwa thanks to the presidential power to declare governor’s rule for a limited period. It repeated the same tactic, with somewhat limited success, in replacing the government of its fallen friend in Punjab. But the party could not avoid falling victim to the old president-prime minister divide. Benazir Bhutto’s husband, Asif Ali Zardari, became the polarising factor. He was accused of massive corruption and the party stood divided between those who saw Zardari as a menace and those who found him a part of the solution. Murtaza Bhutto, Benazir’s brother, who was said to have headed a militant anti-Zia outfit in the 1980s and had been in self-exile since then, returned to the country before the 1993 elections. The strong-headed Murtaza formed his own faction, the PPP-Shaheed Bhutto, contested elections and won on a provincial seat in Sindh. He was killed in a shootout with the police near his residence in Karachi in 1996. President Farooq Ahmed Leghari found in this an opportunity; the PPP government was dismissed and fresh elections announced. The PPP’s vote bank had remained at around 7.5 million during the past three elections; it plummeted to 4.1 million in 1997. This made Nawaz Sharif’s victory a landslide whose gain of less than a million votes gave him a comfortable two-thirds majority in the house. This was the second occasion in the country’s history when a party had returned with such a heavy mandate. The first was in 1977, which was disputed by the opposition and the subsequent conflicts and protest campaigns had paved the way for the military to wind up the entire democratic system. The PPP’s supporters were in mourning and the overall atmosphere of the 1997 elections was not festive. Bans on cloth banners, hoardings, etc, introduced in the previous elections were extended; the election campaign set no printing presses rolling this time. The electoral carnival was shortened as it was decided for the first time to hold the polling for the national and the provincial assemblies on the same day. The qualifications for contesting candidates were made more stringent. The declaration of assets by elected members was made an annual requirement and they were asked to submit affidavits declaring that they had not defaulted on a bank loan or in payment of government dues. A new ordinance also required them to swear by their party affiliation and commit in writing that they would not violate it under any circumstances. The most exciting of the twists in the political drama over the past decade had been provided by politicians’ acts of infidelity. But the Jamaat-i-Islami was not satisfied with these measures and boycotted the polls, demanding a purge of the ranks of politicians. The party in fact had failed to reinvent itself after the demise of the Islami Jamhoori Ittehad and its experiment of contesting under the guise of the Islamic Front in 1993 had failed miserably too. 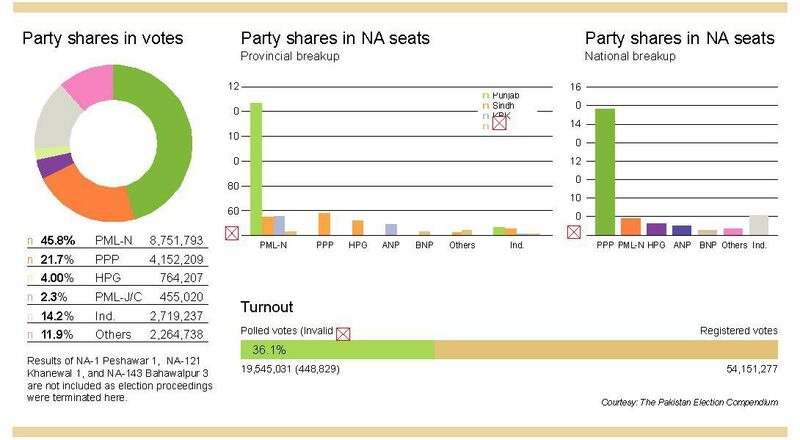 A new party, the Pakistan Tehreek-i-Insaf, took part in the elections for the first time but none of its 134 candidates for national seats came in at even the runner-up position. The highest vote taker was Imran Khan himself as he polled just over 10,000 votes in two of the nine seats that he contested. Following the operation in Karachi, a faction of the Mohajir Qaumi Movement (MQM) broke away and contested elections under the name MQM-Haqiqi; the main party controlled by Altaf Hussain from London continued to contest under the label of the Haq Parast Group. Adult franchise finally reached the tribal areas in 1997, half a century after the independence. The seven agencies with eight seats in the National Assembly had an electoral roll of just 37,000 voters that were handpicked by the federal government under the criteria set by colonial rulers. Members from Fata had earned notoriety for changing loyalties in favour of whoever was able to form government and offer them privileges. The president’s act of extending adult franchise made the rolls 1.6 million-strong. The rolls laid bare the huge gender disparity as they registered 35 women for every 100 men. The president did not, however, extend the Political Parties Act to the tribal areas, and resultantly the much-hyped electoral activities in Fata remained limited. same corrupt politicians keep coming back to power again and again, to all Pakistanis wake up and elect honest leaders and be part of history this time. bring change to your country.